Slickstitch were moving to a new building and wanted to create a storage floor over the production area. They wanted to minimise the number of columns to enable them to install very large machines with as few restrictions as possible. They also wanted the existing building columns to be unobtrusive in relation to the overall mezzanine design. Our solution was a floor designed around a column grid of 12.5m x 8.5m. This raised some challenges, namely the point loads imposed by such a large grid on the building floor, and the amount of deflection on the mezzanine between the columns. Bradfields arranged core samples, compression tests, analysis and structural calculations to make sure the structure and the building floor carrying it were fully calculated and proved. We also redesigned the structure to further control deflection over and above the normal levels allowed for storage floors. 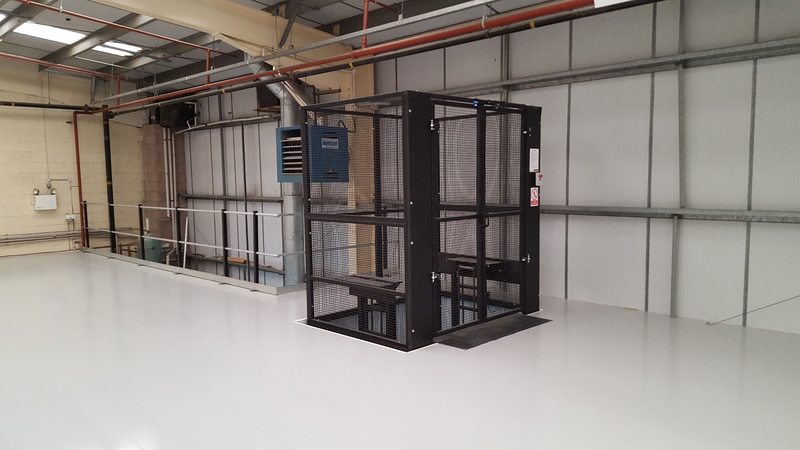 As part of the project we installed safety loading gates, provided fire protection to the underside of the floor, and introduced Slickstitch to a goods lift provider. We then liaised with them to integrate the installation of the lift into the project. As is often the case Bradfields dealt with Building Regulations and the Fire officer on the clients behalf. Once the floor design was agreed the only unusual part of the construction was lifting and installing the large steels. Dealing with these larger components is becoming more common as we frequently offer design solutions which fully meet the client’s needs rather than offering standard solutions the client has to work around. Our design gave Slickstitch the peace of mind that they had a versatile solution not just for their immediate needs but also for the future.